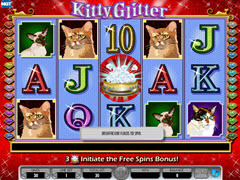 Kitty Glitter Pokie Review Play today! 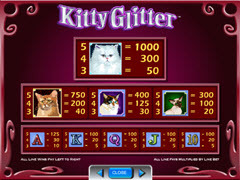 Kitty glitter is a game from IGT for feline lovers. It offers 5 reels with an astounding 30 paylines. This privileged and pampered kitty has bowls of diamonds for scatters and a glitzy dazzling logo for wilds. In the great scheme of hierarchy, cats believe that they are at the top of their pyramids arrogantly looking down on everyone as if to prove they are better than the rest, show this is a prestigious pokie to play and if you play your moves just right, you will be rewarded. The huge sparkling diamond is the symbol for the accumulator. The fluffy Persian cat haughtily saunters across reels, while the down to earth ginger tabby looks on. The calico cat awaits his turn while the Siamese juggles for position with the haughty Persian. The graphics are amazing and colourful. The cats seem life like with their stunningly beautiful eyes. The usual players are also present. This sparkling game is dominated by a lovely blue background making it easy to visualize. The wilds will only appear on reels 2 to 5 and will be shown in as the game logo in a golden frame. The wilds can substitute for other symbols and complete the combinations that come forward on the same line. The kitty bowl filled with diamonds will be shown on the scatter symbols, which will only be shown on the 3 center reels. These symbols have the important feature of activating the bonus feature when all 3 of the symbols appear on the reels at the same time. In the bonus feature you will be rewarded with 15 free spins at a time with the opportunity of reactivating the feature to get up to an amazing 225 free spins in total. Along with all the free spins you will also receive a special wild symbols, which will change normal symbols into wilds on reels 2 to 5 each time you collect 3 or more diamond wilds. Up to 4 of the normal symbols can be changed into extra wilds during the free spin bonus feature. The Kitty glitter game is fun and easy to play. It offers wilds and scatters as well as stacked symbols which will award the player a multitude of winnings. This entertaining game has the power to keep you glued to your screen and win amazing prizes, features and a whole lot of mystery to keep you enchanted.